CHINA: The world’s largest Ferris wheel has officially opened in China for the public. The £17.4 million structure donning 36 carts on the wheel happens to give a highest 745 feet view in its half-an-hour-spanned ride. Each cable can accommodate eight to ten passengers and is equipped with WiFi, air-conditioning, and a TV set – where it is speculated that the TVs will be displaying a real-time footage of the site. With some 4,600 tonnes of steel used in the making, the wheel will tend as the newest and most eye-catching landmark of Weifang. 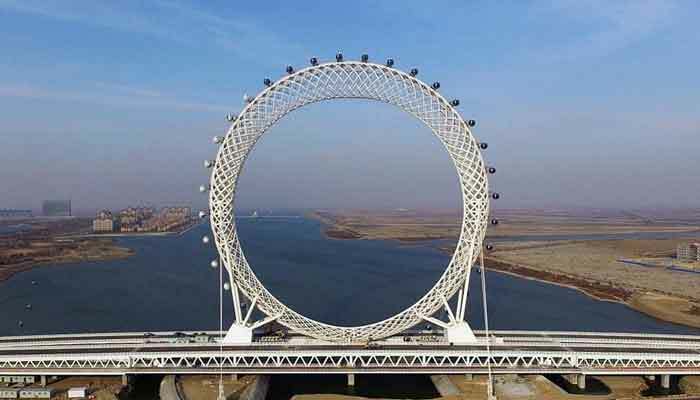 The wheel has been constructed in a ‘dragon spine’ structure with its crisscrossing steel and a complex architecture for it to stand over the 540-metre-long (1,771-foot-long) Bailang River Bridge, Shandong Province. The 'High Roller' in Las Vegas happened to be the earlier World’s Largest as a Ferris wheel for its 167 metres (550 feet) height with 112 cables. The 'High Roller' had recede the 'Singapore Flyer' in Singapore with a world record by just two metres (6.5 feet) in diametre.